Past Projects | David Geffen School of Medicine Class of 2018 "Dream Campaign"
Our crowdfunding campaign has ended, but you can still support the David Geffen School of Medicine Dream Scholarship by clicking here. David Geffen School of Medicine Class of 2018 "Dream Campaign"
Welcome, and thank you for visiting the David Geffen School of Medicine (DGSOM) at UCLA's Class of 2018 giving page. It's our pleasure to support the 2018 class in implementing this year's "Dream Campaign" for undocumented DGSOM students. We hope that you join us as we continue to cultivate and foster an environment of diversity, inclusivity, and equality at our medical school. 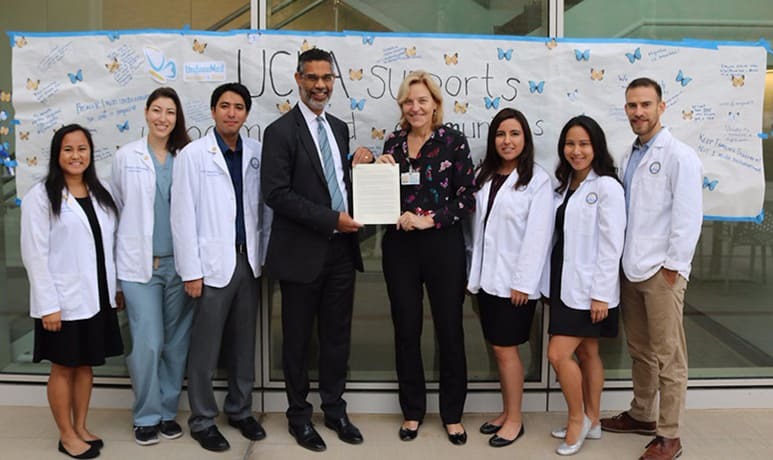 DGSOM at UCLA Dean, Dr. Kelsey Martin, and Vice Dean for Education, Dr. Clarence Braddock III , and UndocuMed student advocates. Introduced in August 2012, the Deferred Action for Childhood Arrivals program, or DACA, is an executive order protecting individuals from deportation who were brought to the United States as children. DACA status allows individuals to obtain work permits and stay in the United States but does not provide a pathway to citizenship. In September 2017, the current administration made the decision to rescind DACA, affecting 800,000 individuals. However, the University of California issued a statement of principles reaffirming its commitment to vigorously protect the privacy and civil rights of undocumented students. The David Geffen School of Medicine is committed to welcoming and supporting students regardless of their immigration status. For more information, please visit the UCLA Undocumented Student Program site. Each year, the senior class at DGSOM organizes a fundraiser to raise funds for a medical student scholarship. This year, the Class of 2018 voted overwhelmingly in support of raising funds for The Dream Scholarship for undocumented medical students. Undocumented medical students face unique financial hardship because they are ineligible for federal loans and institutional loans are limited. We hope you will support our campaign as we stand in solidarity with our future colleagues. The DGSOM Class of 2018 values community and diversity in medicine and hopes to send a positive message locally and nationally​. For a word from Dean Dr. Kelsey Martin and Vice Dean for Education, Dr. Clarence Braddock III, on DACA and DGSOM at UCLA, please click here. DGSOM students in support of undocumented students. Donate enough to power someone's day! We're so grateful that you're choosing to support DGSOM Class of 2018! The most basic instrument we need as doctors! You can't train to be a doctor without this essential tool! The universal symbol of a doctor! Although, white can get dirty easily... Every student needs at least two! Whether electronic or hard copy, textbooks have a starring role in the life of a medical student. Studying for "Boards" requires library subscriptions with access to example questions. This donation would cover ONE year of ONE question set! In order to graduate, every medical student needs to pass three national board exams. This donation covers the cost of one of those exams. Believe it or not, medical students also need to pay for their own health insurance annually! Cross-country flights and hotels, a bite to eat on the road, and the application itself add up, applying to residency can be as expensive as it is stressful! As future doctors, we want to set a good example. Help keep a med student's body nourished and mind focused with this donation in support of healthy eating. Living in Los Angeles can be financially challenging, help keep our med students covered year-round in the United States' second largest city.